Forgive me for being sexist but I do especially love a young male narrator. And there can be none more flawed, fascinating and powerful than Hal, HM Castor’s protagonist who becomes Henry VIII. Henry has had many fictional outings (and I’m afraid he can’t help but look like Jonathan Rhys Meyers in my head, though that’s no kind of disadvantage), but by no means too many - and HM Castor’s direct and original take on the king is a brilliant addition. Written in the first person and in present tense, the novel takes you into Hal’s head, and into the moment. Now I have limited patience with present-tense writing (even when I’m using it myself) but in this instance it felt exactly right - immediate, vibrant and powerful. Hal spoke straight into my head, and much like the hallucination that haunts him, I felt I was constantly in his. That gives the reader an empathy and understanding that might otherwise be tremendously hard to achieve, given what he gets up to. As it was, I never lost sympathy with him, not once, even though the author herself acknowledges his sometimes monstrous villainy. These are some of the most physically vivid descriptions of depression, mania and paranoia I have ever read. Hal is alternately endearing and terrifying; one moment you’d like to hug him, the next to - well, shall we say snog him. And the next, you know all you’d do is run. Hard and far. There are shades of Mary Renault’s Alexander in Castor’s descriptions of battle - when you can hear the swords clash and smell the blood - and also in Hal’s need and longing to lead his troops from the front, to get down and dirty and fight at the side of his friends. That makes it all the more tragic when he descends into the tyrannical fear and paranoia of his later years, and so many of them pay for it with their lives. HM Castor is so at ease with the historical period, you’d think she’d been there, and the sheer beauty of much of the writing doesn’t hurt; the descriptions of Hal’s physical surroundings and experiences are completely sensual. But it’s what goes on in his head that keeps you reading. Hal is a creature of his time, but he’s also a human being, a flesh and blood boy and man who might be living now. I thought I might be alienated by Hal’s visions of a sinister child - whether a delusion or an actual ghost - but I found them entirely believable, and a solid reality in Hal’s mind. They contribute to his crumbling grip on morality, but they’re not solely responsible. VIII is a fine distillation of the compromises, the cruelties and the pragmatic ruthless realities of politics: realities that can so easily morph into that tendency of absolute power to corrupt. I loved this book, and what’s more, I’m far more confident now of remembering both the order and the fate of the six wives. Go and buy it. Fascinating review! I have the book on my TBR pile and will read it early in the New Year. Can't wait. 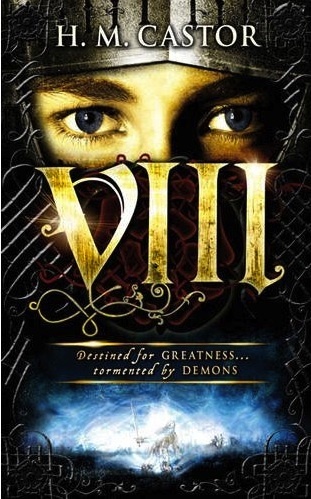 VIII has moved higher up on my book heap today too. Thanks, Gillian.